Accessibility is at the forefront of administrators’ minds when planning new campus construction as they take the opportunity to surpass ADA standards. 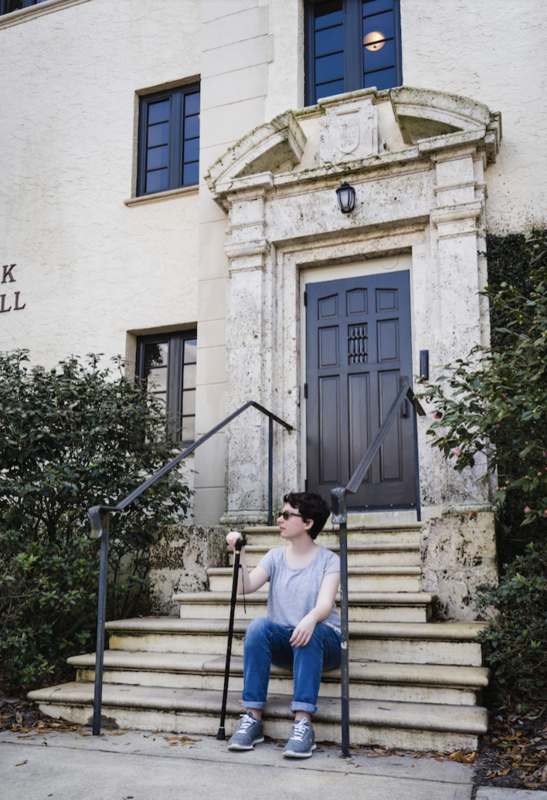 On a historic campus with century-old buildings, students with disabilities find it difficult to traverse campus, which is plagued by lots of stairs and few elevators within buildings. Students have demanded change, and now the College seems to be listening. Complying with the Americans with Disabilities Act (ADA) standards has become the bare minimum goal of upcoming projects. Now, administrators are seeking universal design, specifically in the construction of the new Lakeside Residential Complex and parking garage. However, while there is a better future ahead for the ease of individuals of all mobilities, the current construction projects have led to blocked pathways and steep ramps that are still causing issues. The new Lakeside Residence Hall will have an emphasis on accessibility within all rooms, not just the rooms designated for students with disabilities. Twenty-six out of 125 apartments will be designated “accessible,” and seven of those 26 will be designed specifically for students in non-transferable wheelchairs, according to Scott Bitikofer, assistant vice president of Facilities Services. These rooms will include roll-in showers, a washer and dryer stacked side-by-side rather than over-under, and accessible kitchens. The seven wheelchair-accessible rooms will be dispersed on the first, second, or third floors, which can be exited without using any elevators due to the multi-tiered and graded design of the apartment. These rooms will be distributed among all apartment types. “Five of them will be in [apartment] units where there’s one accessible room in the otherwise fully accessible apartment with the roll-in shower,” said Bitikofer. Therefore, five suites will have one wheelchair-accessible room (with a roll-in shower) and several other dorm rooms that are not ADA compliant. Two of the wheelchair-accessible dorm rooms (with roll-in showers) will be in the same apartment in case two students who need the same accommodations want to live together. Bitikofer said that the entire building will be accessible for entry and use, not just the rooms marked that way. He said that all of the apartment units will have clearances wide enough for wheelchair access. The architects for the project are incorporating universal design, meaning that their goal is to make the entire space accessible for people of all abilities. One example is the decision to change the height of the table tops in all apartments, not just the ones with accommodations. “Originally, in the dining room area we were going to have high-top tables,” said Bitikofer. “Obviously that doesn’t work for someone in a wheelchair, so the decision was made to actually lower all of them… down to an accessible height.” That will be done in all apartment units. Access to parking and dropping off items like groceries was also brought up as something that must have accessible design. The main parking for the new residence hall will be across campus in the new parking garage; however, it was noted that 15-minute load and unload spots have been requested for the Lakeside Residence Hall area, similar to the round-about circle by Elizabeth Hall. Besides the new residence hall, Bitikofer explained the concerns with accessibility in the new parking garage. There will be accessible spaces in the new garage; however, Bitikofer is aware that the garage is a long distance away from central parts of campus. Lack of proximity would make it hard for individuals who may not be using a wheelchair, but who have difficulty walking, to reach their destinations. Bitikofer said that the internal parking on campus will see a rise in accessible options. He will try to move the accessible parking to parking lots like the Alfond Sports Center, which are closer to destination buildings. The College selected EYP, a New York-based architectural firm, to perform a campus-wide audit of campus accessibility. The company is familiar with the Rollins campus due to its work on the Bush Science Center and the new Mills building. Rollins stressed the importance of knowledge of “true accessibility access according to both law and spirit, not just code compliance,” in the request for proposals. They also requested consultation on universal design principles. The audit will be completed over the summer, but on May 1 students will be able share their concerns with EYP before the audit begins. The meeting’s location and time will be released as the event gets closer. Other plans include improved universal design in the new Lakeside Residence Hall. Disability Alliance, a new club that formed in response to accessibility issues on campus, had its second meeting with administration to discuss these plans. During its meeting on Friday, April 5, Whitney Horton, director of accessibility services, updated club members on construction developments. After speaking with Campus Safety, Horton is in the process of getting ADA-compliant parking spaces marked on the campus maps. She is also collaborating with Scheduling and Event Services to provide warning notifications when groups book events in an inaccessible room. Before diving into accessibility plans for the new residence hall, Horton confirmed that there will be push buttons added to the internal doors of Skillman Hall, the newly renovated dining hall. Push buttons are a feature that many buildings, including the newly renovated Rice Family Pavilion, lack. A concrete pathway is also being designed between the areas of Sutton Place Apartments and the Cornell Social Sciences Building, which will be built once construction on the new parking garage is complete. For students with mobility aids, this is a more accessible option than brick, which many current campus pathways are made of. The growing pains that all students and faculty have experienced during construction on campus are only exaggerated for students and faculty with disabilities who find previously accessible pathways obstructed, more ramps that are too steep, and bumps that are used to cover electrical strips blocking the accessible walkways. Horton feels the strain of the ongoing projects. “We have some very serious issues right now in the midst of construction, and so, the hope that I have to continue looking towards is what it’s going to be like once it’s completed,” she said. Perhaps most striking right now is the lack of accessibility to the Sutton Place Apartments, which house a large population of upperclassmen students, faculty apartments, and the Center for Inclusion and Campus Involvement. In the unexpected rapid construction of the new parking garage, a ramp had to be built before one of the city’s electric boxes could be moved. “That was a huge miss on the part of the contractor and unfortunate to say the very very least about it,” said Horton. “But I think that in all of these cases, I have to look to the bigger picture and say sometimes there’s a miss, but at least there’s a plan in place that’s going to be fixing it. And so, it’s very hard,” she said. “I hate that we have to accept that things aren’t good right now… but they’re definitely thinking about it,” said Horton. According to Bitikofer, the electric box that has prevented the end of the ramp from being completed in full ADA compliance will be moved, and the fixed ramp will be finalized before students move back to campus next semester.